Journalist Johann Hari said in his new book that people who are depressed are not victims of bad brain chemistry. They are depressed because they are disconnected from things that make life worth living. They are disconnected from meaningful work, meaningful values and meaningful relationships with other people, from status and respect, the natural world and a secure or hopeful future. 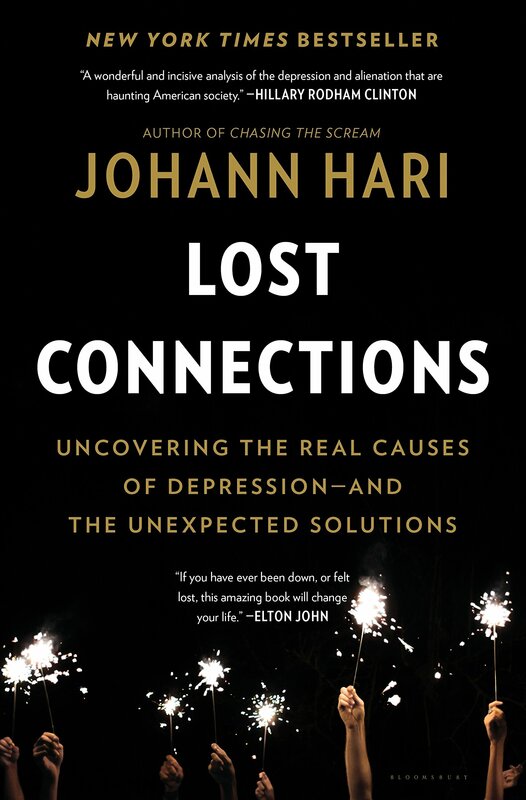 In LOST CONNECTIONS: Uncovering the Real Causes of Depression—And the Unexpected Solutions (2018), Hari walks the reader through the scientific research that shows how people suffer when they are disconnected from the things they need, and how they can heal when they recover those connections. Depression and anxiety are big problems. Hari said psychiatric drugs are being taken by one in five American adults, one in three French adults and an even higher proportion in the UK. The death rate in the United States is actually increasing, driven by “deaths of despair”—suicide, drug overdoses and alcohol-caused liver disease. The World Health Organization reported in 2010 that depression is the world’s second leading cause of disability. Hari said therapists can help, and gave examples. He said there are ways people can help themselves, and gave examples. Medication has its place, although often ineffective. Hari deeply regrets the 13 years of his own life that he spent taking antidepressants. But feelings of depression and anxiety are not the problem, according to Hari. Pain, whether mental or physical, is a message that lets you know something is seriously wrong. The rising rate of depression is a message telling us that something is wrong with our society. In organizations, you might think that the managers and decision makers would be under the most stress, while those with less responsibility would be the least stressed. A study of the British civil service, among others, showed that the opposite is true. The lower your rank, the higher the stress. What causes stress is lack of control, Hari reported. Employees are stressed when they have to produce results without being able to use their best judgment as to how to produce these results. They are stressed when they don’t know the meaning or purpose of their work. They are stressed when nobody notices whether they are doing a good job or not. They are stressed when they’re on call even after the work day ends. They are stressed when they don’t know whether they are going to have a job next week or next year. Lost Connections gives examples of workers dealing with all these things. Stressful working conditions are on the increase. We the people were told that technological advances would result in all the routine work being done by machines, and more fulfilling, higher-level tasks being done by humans. I believe such a path is possible, but it has not been the path chosen. Instead we got Frederick W. Taylor’s scientific management, factory automation and computer numerically-controlled machines. The purpose of these innovations was not to make workers more skilled. It was to make them more replaceable. High tech executives continue to push to eliminate the human factor from work, even when there is no need or demand for it, such as self-driving cars, and even when the public hates it, such as elimination of human interaction from customer service. Workers do not suffer from a chemical imbalance, Hari wrote; they suffer from a power imbalance. Elon Musk and other high-tech executives say that technology will eliminate so many jobs that the only solution will be a universal basic income for the now-useless workers. This is the dystopia foreseen in Kurt Vonnegut Jr.’s great SF novel, Player Piano. In the novel, men thrown out of work by automation are not really incapable of doing anything needful or useful. It is that they have to go outside the economic and technological structure of their society in order to do it. Johann Hari favors a universal basic income. He tells about the experiment in which the people of the small town of Dauphin, Manitoba, were each given $19,000 a year (in today’s money), no questions asked. They didn’t need to live on the $19,000 and they didn’t try. It just gave them a freedom from fear they didn’t have before. The result, Hari said, was an improvement in all aspects of life, including the medical. In particular, fewer townspeople complained to physicians about mood disorders. The important difference between Johann Hari’s actual town and Vonnegut’s fictional town was that everybody in the Manitoba town still had jobs. An income guarantee need not be a tradeoff for mass unemployment. Johann Hari was once addicted to junk food. He said there were periods of his life when he virtually lived on fried chicken. He went into a Kentucky Fried Chicken place in London one Christmas Eve, and the servers gave him a giant signed Christmas card for being their best customer. He said he knew junk food wasn’t good for him, but it was tasty, cheap and convenient. Advertising culture gets us addicted to junk values, Hari said. The basic message of advertisers is that, without their product, you will be unattractive, unsuccessful and unhappy. Children are especially vulnerable to this. This is why teenagers think they are losers unless they have certain brand-name clothes and sneakers. Philosophers for centuries have said that if your life revolves around money and possessions, or around how you look to other people, you will be unhappy. According to Hari, scientific research shows this is true. When people who are above the struggle-for-survival level sit down and write what is important to them in life, and they then write down what they spend their money on, the two lists rarely match up. The venture capitalist Paul Graham once wrote an essay about the logic of a free-enterprise consumer market is to make products that are addictive and how, if nothing else changes, we can expect addiction to accelerate. Things that are intrinsically satisfying make you happy if you have them. Addictive things make you depressed if you don’t have them, and you never have enough of them. Another major cause of depression is loneliness. The best way to overcome loneliness is to join with others to do something you all care about. Hari told stories about people who did this. The most inspiring story is in Chapter 15. Read it if you don’t have time to read the whole book. The saga begins with Nuriye Cengiz, a 63-year-old wheelchair-bound Turkish woman who wore a headscarf and lived in a housing project in Berlin. She didn’t know any of her neighbors. One day in the summer of 2011, she put a notice in her window that she was going to be evicted on such-and-such a date for nonpayment of rent, and that, having no place to go, she intended to kill herself the night before. She didn’t expect anything to happen as a result of the sign. She just wanted people to know the reason for her death. Other people in the building also were having trouble paying rent. They got the idea of staging a protest by blocking the street, with Nuriye in the middle. They set up chairs and an impromptu barricade. Because they were afraid the police would come at night to remove the chairs, they organized shifts to stand guard. The apartment dwellers had virtually nothing in common in their backgrounds. Some were Turkish immigrants. Some were gays. Some were left-wing squatters. What they had in common was being marginal people with a common problem. Nuriye did her shift with Taina, a 46-year-old single mother with peroxide blonde hair, tattoos and a miniskirt that she wore in all weather. To the surprise of both of them, they became the best of friends. To the surprise of all, they were able to sustain their movement, and reach out to tenants elsewhere in the city who faced rent increases they couldn’t afford. The owner of a gay bar across the street gave them chairs and a place to meet. Construction workers in the neighborhood built a construction site. A homeless man who joined the protest turned out to be a fugitive from a mental institution. When he was captured and recommitted, the protestors spent eight weeks demanding his release, which authorities eventually agreed to. That’s how you create respect for diversity and multiculturalism—by having different kinds of people work together for a common purpose. At the time Lost Connections went to press, the protestors had won a partial victory. They also, on Hari’s telling, felt they were no longer were suspicious of and isolated from their neighbors. And they also, according to Hari, had less need to take antidepressants. I recall that the great Jane Jacobs said once—I can’t find the quote—that although people will fight to defend their communities, millions of people have no knowledge of what a real community is. The lesson of Nuriye’s story is that people don’t have to be isolated. They can join together to form communities for common purposes. The problem with finding meaning by fighting for justice is that you often will suffer the pain of defeat. But as George Orwell remarked, concerning the Spanish Civil War, it is better, even from the standpoint of survival, to fight and lose than to surrender. What’s conspicuous by its absence from Lost Connections is mention of organized religion. For many people, their religion is a source of community, a source of purpose and meaning and a reminder of what is important in life. The decline of religious belief has left many people alone and adrift. Hari does touch on religion in a peripheral way. He reports on Amish and Hutterite communities, which are close-knit and largely free of clinical depression. Amish and Hutterite people do meaningful work, have close ties with neighbors and friends and seldom yearn for what they can’t have. The drawback of their way of life is that they have little place for individuals, rebels and heretics. Of course that’s also true of any strong religious community. Hari reports on a form of meditation called “sympathetic joy.” You begin by thinking about times when you were happy and rejoicing in it. Then you imagine your loved ones being happy. Then, strangers. Then, even your enemies. The intended result is that when you see someone who is happy, you don’t feel envious. You share their joy. Hari said that, when he was feeling down, he used to give himself a treat, such as going to a movie or a restaurant. Now he tries to do a good deed, something that ideally makes someone else happy. That lifts his spirit, he said. I think Johann Hari is mostly right. He is right to say that many people are diagnosed as depressed due to brain chemistry when they are suffering in bad situations for understandable reasons. He is right to say that the pharmaceutical industry has incentives to promote its products as the exclusive treatment for depression. Hari admits that heredity and brain chemistry might make some people more susceptible to depression due to stress and anxiety, but he says the stress and anxiety are the key factors, not the heredity and brain chemistry. Is depression no more than an extreme form of sadness and grief? People who suffer from depression describe it as a kind of living hell, different from normal human emotion. Some people get depressed when there is no outward reason that would explain this. I don’t have any knowledge or experience that would make me be able to judge. If you think you need psychiatric drugs, I’m not going to tell you not to take them. I assume that people reading this web log have sense enough not to look to someone like me for medical advice. All I can say for sure is that the world would be better off with more social justice, better human connections and less use of antidepressants. Mad in America. A web site for critics of psychiatric drug use. ‘The opposite of addiction is connection’ A reference to Johann Hari’s earlier book, Chasing the Scream, in which he questions the chemical basis of drug addiction. I haven’t read the earlier book. Lost Connections review: Shedding the shame of depression by Houman Barekat for the Irish Times. Lost Connections view: Johann Hari on how we should talk about depression by Jo Case for the Sydney Morning Herald. Hat tip to Steve Badrich for suggesting this book. This entry was posted on April 23, 2018 at 1:05 pm and is filed under Psychology, Society. You can follow any responses to this entry through the RSS 2.0 feed. You can leave a response, or trackback from your own site. People who are depressed are not victims of bad brain chemistry – they’re depressed because they are disconnected from things that make life worth living. My expatriate friend Jack told me that I am not qualified to have an opinion on this topic, and sent me this link.